The Wallabies team management deserves to be snubbed and ridiculed by the long-suffering Australian supporter base for a senseless demolition of a Bledisloe Cup campaign. Wallabies fans have a multitude of reasons to feel disgusted by what occurred at Eden Park on Saturday - and the blame lays squarely on the Test selectors, in particular coach Michael Cheika, for making a mockery of their lofty positions. The selectors unnecessarily hobbled the Wallabies by choosing a ludicrous starting line-up. 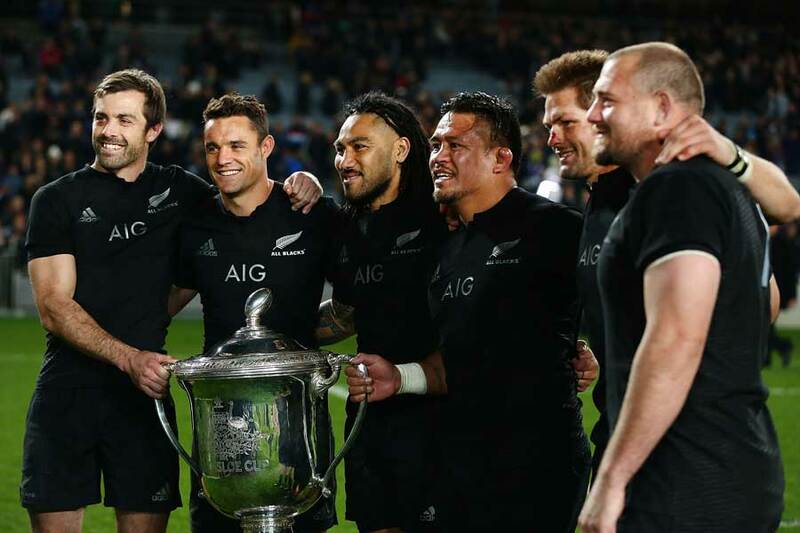 A more-than-reasonable chance to wrest the Bledisloe Cup from the All Blacks after 13 exasperating seasons was ruined by sheer off-field stupidity. I wrote on ESPN when the team was announced last Thursday that this was among the "craziest Wallabies team selections of recent times". I would now go so far to say that in my 33 years of covering the Wallabies, including every Rugby World Cup tournament, I have never seen a more preposterous line-up. Greg Smith came up with some odd ones when he was Australia coach in 1996-1997, but nothing like this. "Cheika? Arrogant or ignorant? Probably both." Where was the logic behind changing a team formation that had proven so effective the week before in Sydney? It appeared that Cheika had at last found the right back-row to counter the All Blacks - after David Pocock, Michael Hooper and Scott Fardy succeeded in outplaying illustrious opponents Keiran Read, Richie McCaw and Jerome Kaino. That doesn't happen often. The Pocock-Hooper combination worked a treat. So why change such a devastating combination? Even more stupidly, why weaken it dramatically by dropping your best player - Pocock - to the bench and then adding a No.8, Wycliff Palu, who for some time has clearly been past his best and in years gone by had been constantly dominated by his Bledisloe Cup opponents? Ditto Saturday night. Palu was yet again a passenger. Talking about the pack, where was the common sense in restricting your lineout prowess by bringing in Will Skelton for Dean Mumm, limiting the jumpers to just James Horwill, another struggling big time to show he remains a viable Test player, and Fardy? And as for the mangling of the backline, where do we start? Not having a specialist back-up half-back on the bench was beyond comprehension, because it forced the team to play Nic White for the full 80 minutes, especially as Matt Giteau, who was assumed to be the next best, was required elsewhere to clean up the mess. So the Wallabies were compromised in continuing to play someone who became more flustered the longer the game went on. 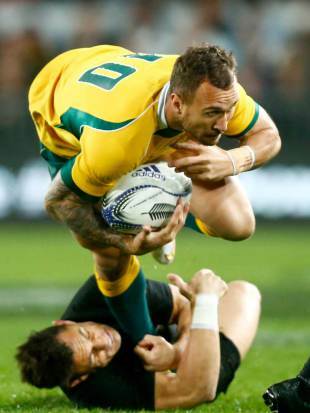 Still the biggest clanger of all was the selection of Quade Cooper at No.10. In Sydney, it appeared that at last the Wallabies had sorted out their midfield tribulations with Matt Toomua and Giteau cohesive under pressure. Forget about all that and bring in damaged goods - a player spooked by the All Blacks. New Zealand have had Cooper's measure for a long, long time; it's rabbit-in-the-headlights stuff, and the All Blacks exposed him again on Saturday. The Wallabies again tried to hide him in defence, a give up in itself, but Daniel Carter kept an eye on him all night, endlessly kicked his way, and the errors built up. Cooper was yet again effectively cooped up. Then a dumb high tackle led to Cooper being sin-binned and with it an overflow of New Zealand points. To add to the Monty Pythonesque atmosphere, Cooper later said: "I feel that I did well." What planet are you on, Quade? And what planet was the Wallabies coach on when he carried on before the game about not being aware that Cooper had a shocker in New Zealand during the 2011 World Cup. What next? The coach stating he didn't know Australia won the World Cup in 1991 and 1999. Those who ignore history are often cast as fools; for good reason. And don't give us this experimentation rubbish, which the usual sycophants in the rugby media - including several former Test players who should know better - are again pushing. This was not the game for experimentation. The next one against the United States in Chicago in a few weeks is for that purpose. Auckland was instead a time for consolidation, because winning the Bledisloe Cup would have been an enormous elixir for the rugby code in Australia at a time when it is under enormous threat due to poor management from the Australian Rugby Union down. There would have been plenty of pomp and ceremony associated with the Bledisloe Cup returning to Australia. Ticker tape parades even? With it a massive wave of excitement. And what a fantastic morale boost a month out from the World Cup. A Bledisloe Cup triumph would have convinced so many Australian followers that it was worth hitting the bank accounts and organising trips to the United Kingdom in September and October. Now everyone feels so deflated, and just a few days after the Wallabies had suddenly discovered some self-belief they are again despondently looking over their shoulder and knowing they once more have to convince the Australian public they're not a bunch of losers who have no idea about winning the big ones. As one of my closest New Zealand friends, with a long, strong history in the media and international rugby, texted me yesterday: "Cheika? Arrogant or ignorant? Probably both." Seven days earlier, Michael Cheika had enhanced his reputation by out-coaching Steven Hansen in Sydney, and I wrote in Ruck'n Maul on Friday that Hansen looks to have met his match in Cheika. Perhaps now Cheika should be fitted for a Dunce's hat.